"Choice" Is An Illusion: Dr. Kenneth Stevens and Jeanette Hall in Quebec! MONTREAL, Oct. 25, 2013 /CNW Telbec/ - The Coalition of Physicians for Social Justice presented a doctor and his patient from Oregon where assisted suicide is legal. Dr. Kenneth Stevens is a practicing cancer doctor with more than 40 years' experience. He is also a Professor Emeritus and a former Chair of the Department of Radiation Oncology, Oregon Health & Sciences University,Portland, Oregon. He has treated thousands of patients with cancer. Jeanette Hall, Dr. Stevens' patient, is thrilled to be alive 13 years after he talked her out of "doing" Oregon's law, i.e., killing herself with a lethal dose of barbiturates. In 2000, Jeanette was diagnosed with cancer by another doctor and told that she had six months to a year to live. This was without treatment. The other doctor had referred her to Dr. Stevens for radiation and chemotherapy. Jeanette, however, had voted for Oregon's law. She had made a firm decision to go forward with Oregon's law instead. 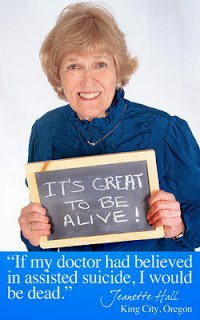 Dr. Stevens did not believe in assisted suicide. He also believed that Jeanette's prospects for treatment were good. He convinced her to be treated instead of doing Oregon's law. Dr. Stevens talked about how the mere existence of legal assisted suicide steered Jeanette Hall to suicide. He also talked about how financial incentives in Oregon's government health plan also steer patients to suicide. Dr. Stevens warned that if assisted suicide or euthanasia is legalized in Quebec, then the Quebec government health program could follow a similar pattern, that is, to pay for people to die, but not to live. Dr. Paul Saba, a family physician and co-president of the Coalition of Physicians for Social Justice explained how Quebec's proposed euthanasia law would encourage people, including young adults with treatable conditions, to agree to euthanasia and throw away their lives. The Coalition's position against euthanasia is supported by the World Medical Association representing nine million physicians. For additional information and references including videos visit coalitionmd.org.